This week’s episode of The Adelaide Show, Growing Data and Getting Laughs, introduces us to two experienced “geeks” and one experienced comedian and producer. 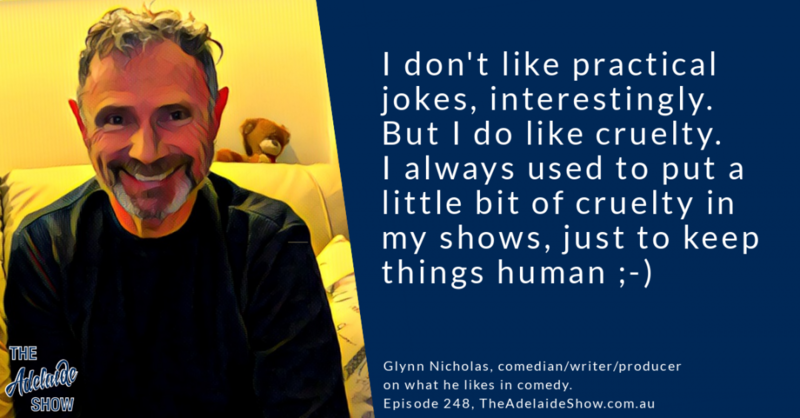 Glynn Nicholas needs no introduction for people who lived through the 90s and enjoyed the ABC’s live, edgy comedy show, The Big Gig. In recent years, he has become a director, producer, and speaker, travelling the world and exporting entertainment. Leo Gaggl and John Ruciak are experienced geeks who know more about how to tame ones and zeroes than most people. They have a community-based venture, the Growing Data Foundation to support open projects and systems and, in particular, the development of sustainable open solutions for community improvement and social good. This week, the SA Drink Of The Week is a wine from Ingoldby. In IS IT NEWS, Nigel challenges us on stories about collecting data. In 100 Weeks Ago, we take you back to episode 148 with author, Simon Butters. In a Story Without Notice, Steve interviews Glynn Nicholas to get some tips ahead of the School Of Hard Knock Knocks comedy course he’s running in Adelaide from June 4-8. And in the musical pilgrimage … we have a song from David Robinson. 2016 Ingoldby Shiraz … tasting notes. I’m starting to count the sleeps until the School of Hard Knock Knocks comedy course begins in Adelaide on June 4. Our master tutor for the stand up course is a former busker turned kids TV performer turned TV comedian turned writer/director/producer turned keynote speaker turned cruise ship performer turned comedy trainer turned podcast guest, Glynn Nicholas. Glynn, if someone’s undecided about joining us for this one-week, five night comedy school with you, what would you say to help them make a good decision and maybe deal with the facing of fears? On the first night, I believe Morry Morgan said we are expected to arrive with 1-2 minutes of material to perform in front of you. This is the dilemma of the blank canvas. My creativity thrives when I’m given restrictions to work within or particular themes to incorporate, but I find that starting with a blank canvas is like being naked and trying to climb up the side of a very steep mountain made of smooth ice. I just haven’t found anywhere to hook into yet. What wisdom do you have to share on this? You’ve had to pull strangers into an audience in your busking days and deal with the stress of being funny on live TV with The Big Gig, how hard are you going to be to impress? Should we expect a wry smile at best? The Big Gig was how I learned about you (I was a bit old for Humphrey). I heard a rumour there might be a tour next year? Does gender sensitivity make characters like Pate Biscuit harder to pull off? Does racial sensitivity make your South African policeman harder to pull off? Or do comics get a free pass to push boundaries? Do we still have a sense of humour that could cope with the Big Gig? Three inspectors to conduct the census of slum dwellings will probably be appointed through Mr. L. C. Hunkin (Public Service Commissioner) at the request -of the Building Act Advisory Committee, which Is meeting this afternoon. A decision will be reached shortly whether a public call will be made for applications. Men with experience in building matters will be preferred, and they will be- required to possess tact and good address. They will be classed as temporary Government employees, and their work will occupy from four to six months. The want of a trustworthy and easily accessible map of Adelaide and its environs has long been felt. Great public inconvenience and loss have been occasioned by the difficulty and -in -many case impossibility of getting an accurate idea of the positions of properties and their relative distances from, one another, and it is undoubtedly one of the first and most important duties of the Survey Department to supply this want. It is on this account that we wish to draw special attention to the letter of a correspondent &#39;A. L.,&#39; whose letter appeared yesterday, and who proposes that ordnance survey maps of Adelaide and the country within a radius of twenty miles should be prepared in the Survey Offices, and published oh a reduced scale for the benefit of the public. Not long ago a published map of Adelaide was suppressed by the City Council on the ground of infringement of copyright. The guardians of the city had paid for plans on a very extensive scale for the deep-drainage system. They published these in the handy and convenient form of a dozen or two volumes, and at the popular price of eight or nine guineas. Having done this they considered that they had done their duty, and that there was no longer any excuse for ignorance as to the topography of the city. The case is typical of the action of the Government and of the various departments from time to time. A good deal of public money has been spent in surveys and the preparation of plans for purposes of a more or less special character, and these having been used have been placed in the Survey Office for reference. This is not exactly what the public wants require. The iconic phrase, information wants to be free, is attributed to Stewart Brand, founder of the Whole Earth Catalog, at a hackers conference in 1984. In the full quote, he says, “on the one hand information wants to be expensive, because it’s so valuable. The right information in the right place just changes your life. On the other hand, information wants to be free, because the cost of getting it out is getting lower and lower all the time. So you have these two fighting against each other.” Tonight, we’re with two Adelaide-based geeks who have created the Growing Data Foundation to support open projects and systems and, in particular, the development of sustainable open solutions for community improvement and social good. 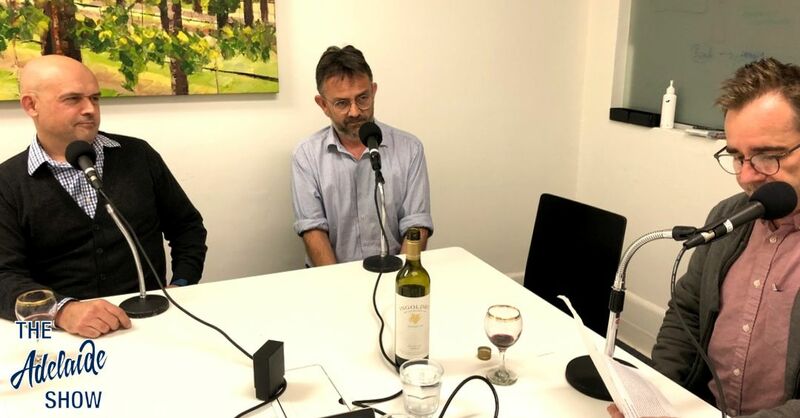 To find out how they’re doing in the good fight to make information free, here’s a welcome to the formal part of the podcast, Leo Gaggl and John Ruciak. Why are you on the side of the argument that believes information should be free? What are you trying to achieve with the Growing Data Foundation. Perhaps walking through some of your projects in depth will help. All sounds great as an idea. Certainly nesting boxes are super important for many species. I have a tree-hollow/nesting box spiel I give at my shows and what I wonder is, can you install the tech on existing boxes? I’ve got James Smith from Faunature coming here this week to deliver 6 nesting boxes (2 for brushtail possums, 2 for ringtails and 2 for our captive squirrel gliders). He’s installed cameras in boxes in the past and posted live images (maybe video, can’t recall) of hatchling birds. So, the project sounds good, and it could help nesting box designers better target particular species. I also like the way it could engage students as well as the citizen-science angle. And the shooting-for-the-moon one: The Things Network. Could your network be used to make helpful, community-based podcasts like ours be readily available, even piped, through buildings, shelters, buses, etc? We opened the vault to go back 100 weeks to the night we spent with local author, Simon Butters. He’d just had a novel released, The Hounded, about a 15 year old boy who is largely ignored by his parents and is followed around by a black dog. Glynn, when you produce shows that have important themes, like Certified Male which taps into the secrets men keep, what comes first, the art or the message? And our song this week is Is There Something Wrong With Me? by David Robinson, selected by our musical curator, Todd Fischer. CD copies of the album will be available from David’s website and from Mr V Records in Semaphore, South Australia. It will also be available digitally from most web-based outlets including CD Baby, iTunes and Amazon.